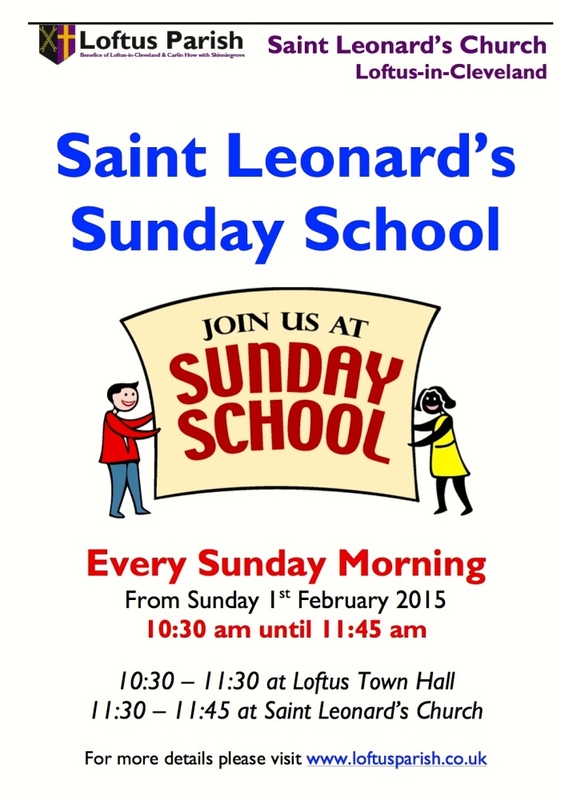 A new Saint Leonard’s Sunday School is planned for Sunday 1st February 2015! The new Saint Leonard’s Sunday School will begin on Sunday 1st February 2015 and will meet every Sunday at 10:30 am in Loftus Town Hall for one hour, after which the Sunday School will move to Saint Leonard’s Parish Church Loftus to receive a blessing and to present their work to Jesus. It is envisaged that the Sunday School will conclude with light refreshments in Saint Leonard’s Church at approximately 11:45 am. The Sunday School is primarily aimed at Primary School aged children, however, the Sunday School is open to children of all ages. If you are a parent/carer/grandparent and want further information about the new Saint Leonard’s Sunday School, then please contact one of the Churchwardens, the Rector directly, or use the contact page on this website. If you are interested in helping out at the Sunday School please speak to one of our Churchwardens or contact the Rector.